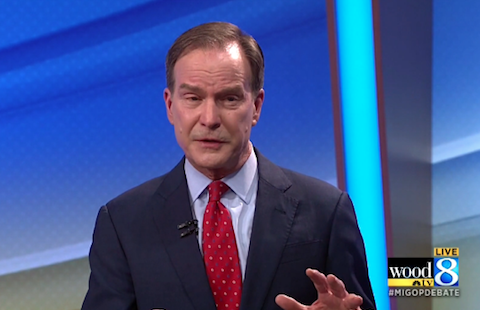 Bill Schuette during Grand Rapids debate. Republican gubernatorial candidate Bill Schuette has personal assets totalling more than $13 million, largely investments in blind trusts or property he inhereted in the U.S. Virgin Islands and Colorado, David Eggert of the Associated Press reports. Schuette is the stepson of the late Carl Gerstacke, who was chairman of the board of The Dow Chemical Co.
On Thursday, he voluntarily issued a financial disclosure showing the assets. He also listed “non-blind” assets held by limited liability companies in which he has full or partial membership interest – including two St. John parcels for sale for $4 million total, a one-third interest in an inherited family home on St. John shared with his two sisters and a $211,000 half-interest in another inherited home in Colorado.